Please enjoy the following guest post from my friend Jenny! Hi everyone! I'm Jenny from Lavish Layerings and I'm so excited to be guest posting for Kellie today! I've been a long-time follower of Kellie's blog and have had the pleasure of getting to know her a bit better this year and she is SUCH a sweetheart! I've always admired her picture perfect swatches and her ability to rock her nails at any length...they ALWAYS look amazing! I feel like my wishlist grows every time that I read her blog, so I thought it would be appropriate for today's post to be about a polish that Kellie featured recently that I have been drooling over ever since. When I think about Kellie, I think about bright, happy colors. I almost went with neons for today's post, but I know that she has a particular affection for corals. For her Valentine's Day mani this year, Kellie featured KBShimmer's Belle of the Mall and I fell instantly in love with its squishy, sparkly goodness. When KBShimmer recently had a 20% off sale, it was one of the first ones to go in my cart and when it arrived, I knew it was the perfect choice for this post. For my mani, I wanted to include some stamping but I also wanted to keep it simple so as not to detract from the gorgeousness of the base. 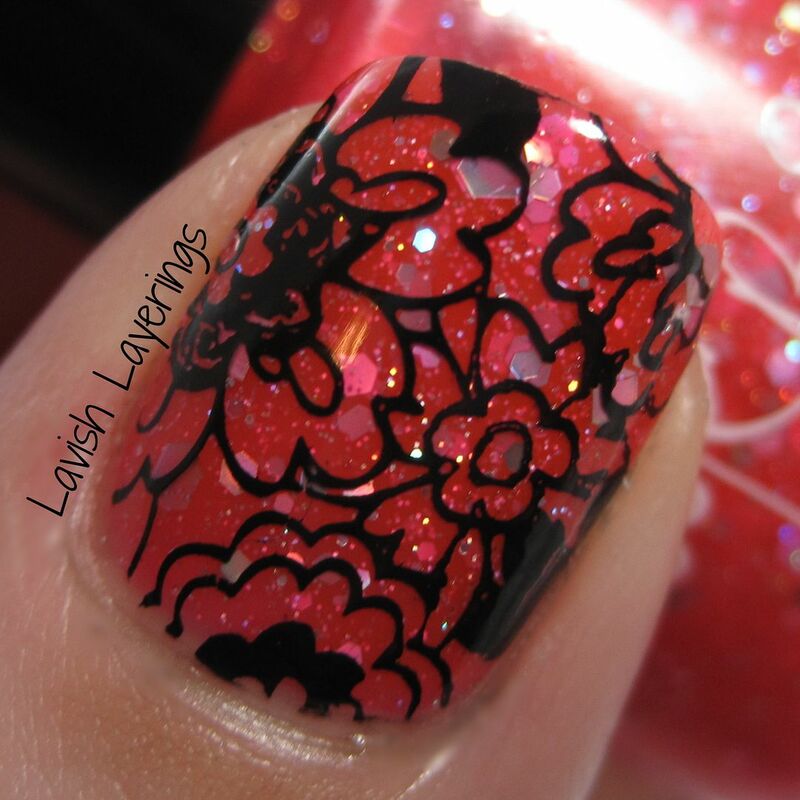 I used an open floral design from MoYou London's Pro XL plate 10 and Mundo de Unas Black for the stamping. 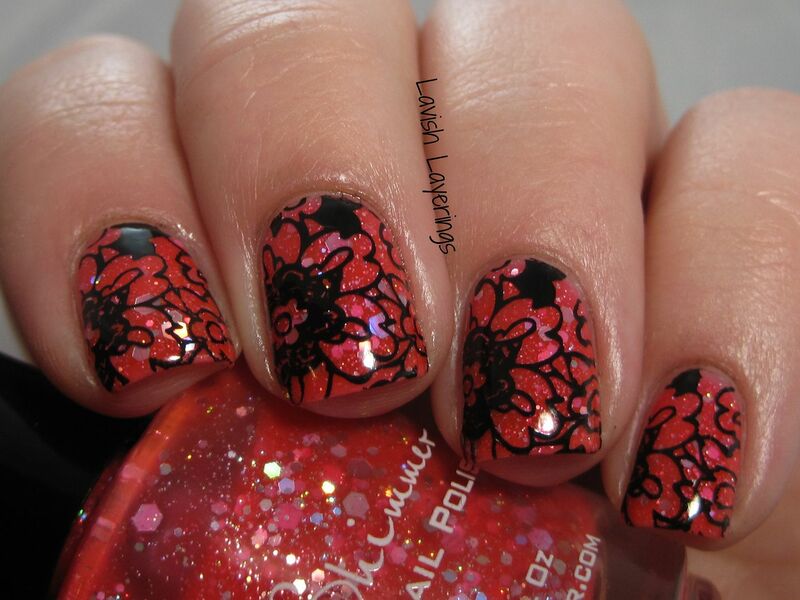 I adore the contrast of the black against the bright coral base and the fact that the stamp doesn't cover up all of the sparkle, but allows it to shine through. Sometimes the simplest manis have the most striking result. And here is Belle of the Mall on its own. It's a squishy, bright corally pink jelly filled with silver holo glitters in different sizes. 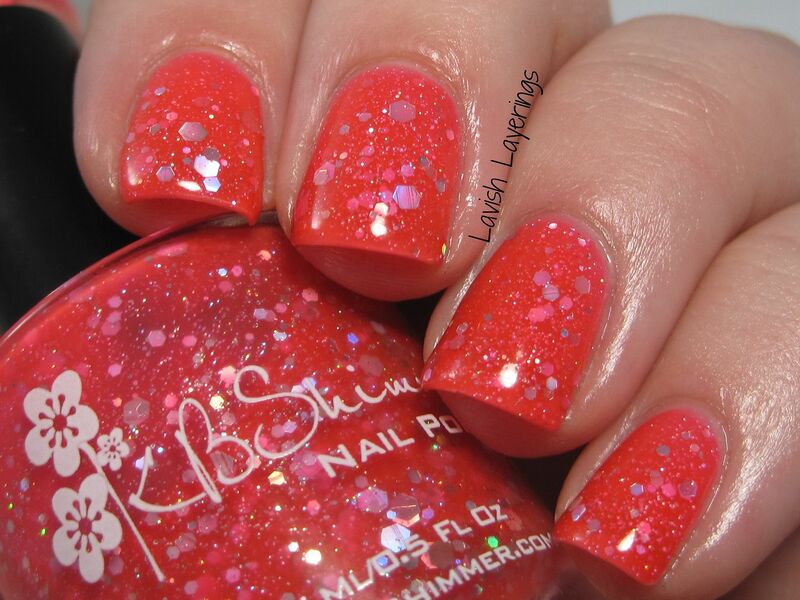 The formula is perfect in classic KBShimmer style with great glitter density and spread. I used 3 thin coats for this mani. Just look at the fabulous sparkly depth! This polish is perfect for spring and summer. It would make a gorgeous pedi color as well. I want to give a huge thank you to Kellie for inviting me to post today and to all of her readers for having me! Thanks so much for looking everyone! Thank you Jenny for your beautiful post! I'm so glad to have met her, she's such a genuine person and she has fabulous skills! Please enjoy the following post from my friend Emily! Hi everyone! My name is Emily and I run the blog Very Emily. I'm kind of fangirling to be guest posting for Kellie today, she was one of the very first blogs I started following way back when her blog was still called Also Known As... I think we started blogging around the same time so I'm proud of us both for still being around after such a long time! I wasn't quite sure what to create for my guest post but ended up feeling inspired by some nail art I spied on the Pet'la Plate Facebook page. I ended up with something slightly different but I really loved the concept so I had to recreate something similar! I started with Icing Mintage as my base, a gift from my friend Deborah (Love Varnish) who brought this back for me from NYC. We don't have this brand here, which is a shame because I loved this polish! Then I stamped over it with a diagonal stripes image from Pet'la Plate Loomy Sunday using Mundo De Unas black and white stamping polish. Finished it with Glisten & Glow HK Girl top coat. While they didn't turn out perfect I loved how these looked from a short distance. So unusual and almost 3-dimensional looking. Hope you like them Kellie and thank you so much for having me! Thanks to Emily for her beautiful work, she is one of my best blog-o-sphere friends and I just adore her! Hi everyone! I'm going on vacation tomorrow for a week so you won't see me, but I have a few blogger friends that will have guest posts up for ya! I'll be heading to Disneyland and the beach down in southern California, yay! I might even get to meet up with my friend Jen from The PolishAholic :D I'm so flippen excited! But today, I have an awesome giveaway for you! 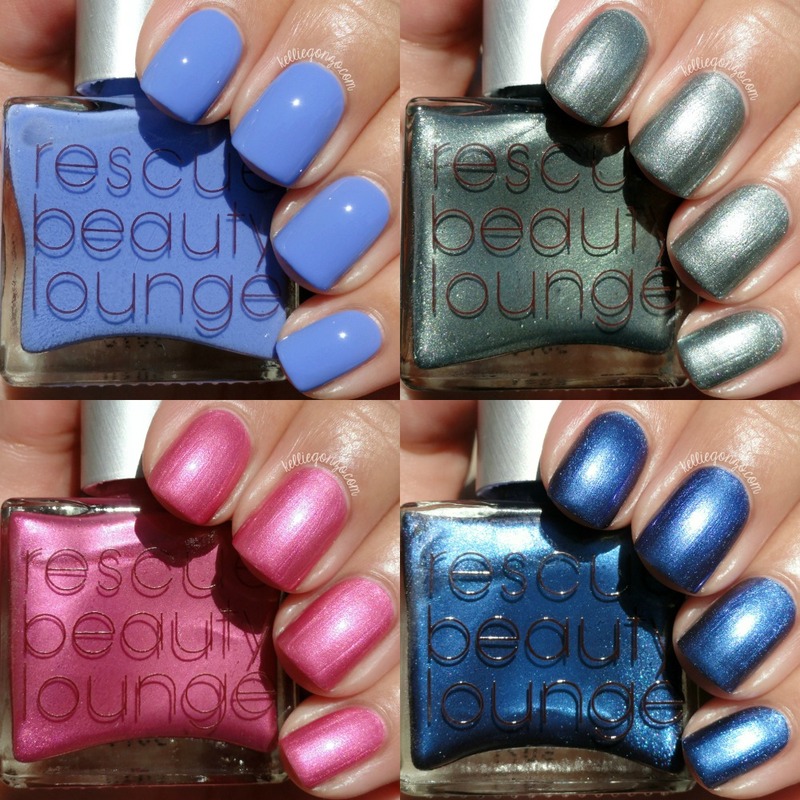 It is for the four released colors from the Rescue Beauty Lounge Je t'aime! Je t'aime! collection that I posted about a few days ago. The RBL bloggers are all participating so you can enter on any one of our pages. Rules: *Begins today and ends 4/14/15 at 12a est. *Open internationally to those 18+. *Must leave a comment on my blog letting us know your favorite shade from the collection. *Additional entries for following each blog or social media page. Thanks for coming by sometimes and supporting my blog :) Love ya! The products being given away were provided by the company for the giveaway. Hey folks, today I wanted to show you the Zoya Spring collection called Delight. It's a six shade collection of pastel-ish "eastery" shades that are right at home in this season. There are three crèmes and three shimmery shades that compliment each other really well. Let's find out how they worked for me! This is Daisy, described as a lemon yellow metallic shimmer with a turquoise flash. I like this color, but the formula was pretty streaky. It's kinda runny which made it pool in my cuticles more than once and when I did clean up around the edges, the teeny shimmery glitter bits went all over my skin. It took a lot to get them off :( This is three coats. Next we have Eden, a floral-like pink crème. This one was creamy but didn't self-level for me, which isn't my favorite thing. This is two coats. This gal is called Leslie, she's a lavender metallic shimmer with a turquoise flash. I normally love lavenders so this one was an automatic winner in the color department for me. It was creamier than Daisy but still on the runny side. This is two coats. Lillian is a pastel aqua blue crème. Same formula as Eden, but I ended up needing three coats to cover streaks. I love this color but was disappointed in the formula. Here is Rayne, a really fabulous dewy spring blue metallic shimmer with a turquoise flash. This would be my favorite but the runny formula just is not working for me on these. Three coats. Last is Tiana, a pistachio spring baby green crème. I got this covered in two coats, but it was also non self-leveling, making application more difficult than it had to be. Gorgeous color though right? I know pastels are pretty commonly hard to get great formulas with, but I am just not impressed with the usability of these. However, I've heard from a lot of my fellow polish lovers that most of these worked out well for them, so it could just be me haha. These are available for purchase on Zoya.com for $9 each. They are also being offered in mini bottles right now for $5 each, though I don't know for how long. 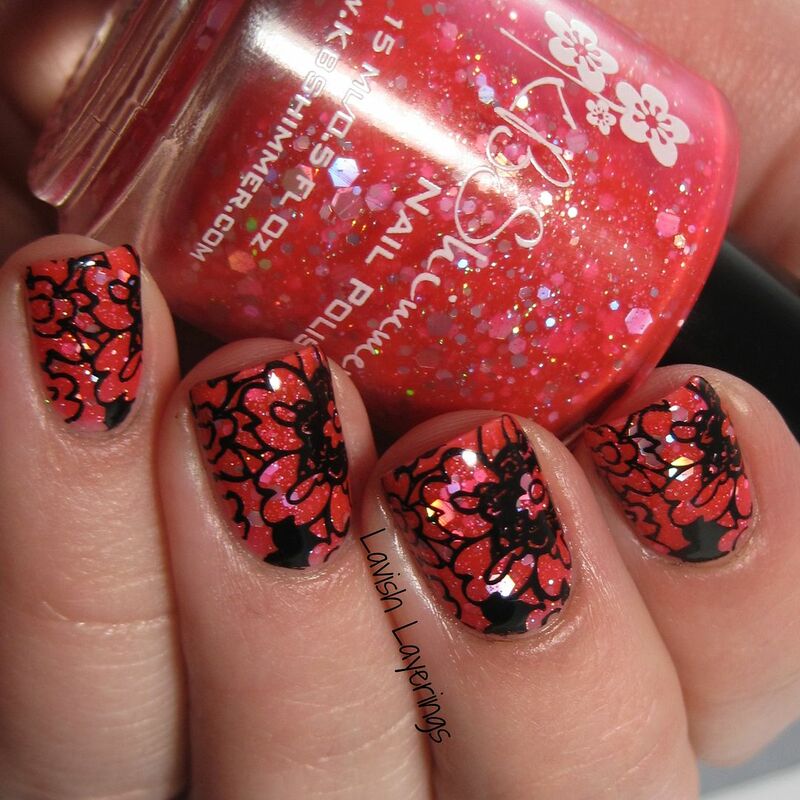 What do you think of these springy shades? Spring might be my least favorite season for color palettes, but I know a lot of people adore them. The photo shows two coats of each shade. The main difference is that EoC is a shade or two darker navy than TTLS. It's also more opaque. TTLS is more squishy and jelly-ish but it's thicker. There seems to be more glitter in EoC. 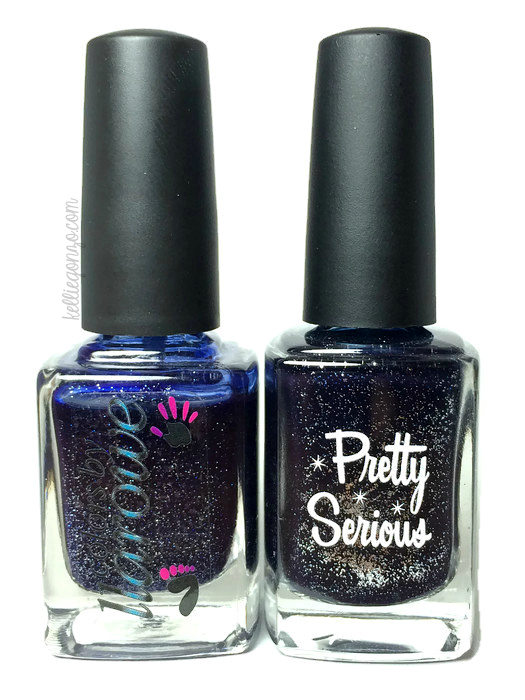 You can purchase Pretty Serious polishes from their website for $9.50 AUD and you can get Colors by Llarowe from their website for $12 each. I like both of these but I've gotta pick EoC because it's easier to apply, it's more affordable and Pretty Serious has cuter packaging. Which one of these would you pick? Hi folks! Today I wanted to share with you the Love Tahiry collection from Color Club. This wasn't specifically described as a Valentine's Day collection but it definitely has those types of shades. These are all designed by Tahiry Jose, who I just learned is on the reality show Love & Hip Hop: New York (sorry, I don't watch it). These all have a special scent to them when they dry. Let's take a look shall we? First is Sweet Getaway, a very neon pink shade. On the nails it appears hotter & glowy-er than the pink color in the bottle. It seems to go on very opaque, but there was still some streaking with two coats so I needed three. It does apply very easily for such a neon color though. This one has a "pink rose" scent. I love rose scented things normally, but unfortunately this scent was too overwhelming for me to want to wear this again. Here we have Tall Dark & Handsome, a dusty deep grey crème. It has a thin formula but is very opaque. I used two coats. This scent is described as "cologne" and that is right on. I like men's scents but I don't know if I want my nails to smell super masculine haha. It was a bit too strong for me. Seal It With a Kiss is a strawberry scented peachy pink light coral crème. This is so my type of color. It was a little on the thick side but manageable. I used two coats. This scent was pretty subtle, but nice and sweet. This is 50 Shades of Love, a topper with metallic red and pearl white heart glitters in a clear(ish) base. You can see how the color on the red hearts has flaked off some and infiltrated the base. I actually like how the red bits look in the base but I wish the hearts didn't look scratched. I had to kinda place the hearts on, but this is one coat over Seal It With a Kiss. This one says it smells like "candy" but it's a very lightly scented one. Next is Red-Handed, a cool red crème. This is pretty basic, but a staple kind of shade. It had a great easy to apply formula. This is two coats. It's labeled as smelling like "cinnamon" but I didn't smell anything except nail polish on this one. This is On Cloud Nine, a squishy white jelly crème. It was still a bit streaky on two coats so I used three. This has a "white chocolate" scent, it was probably my favorite of the scents. And last is Jitters, my favorite shade of the collection with my least favorite scent. It's a rosy pink and silver holographic microglitter with full coverage in two easy coats. I love the way it looks! Unfortunately the "bubbly" scent they put in it, which I'm assuming is supposed to smell like champagne, just overpowers me and it actually gave me a headache. To be fair, I'm pretty sensitive to a lot of scents, but I had to mention it. These are available on the Color Club website for $8.50 each. I also know they are stocked at some e-tailers like Llarowe and HB Beauty Bar (though I have never ordered from HB). What do you think of these colors? How do you feel about scented nail polish? What's up folks? I know I just reviewed a cuticle butter the other day, but I actually have another one to tell you about already! The company it's from is called Fortune Cookie Soap, you may have heard of them because they're pretty popular online, but I just discovered them. 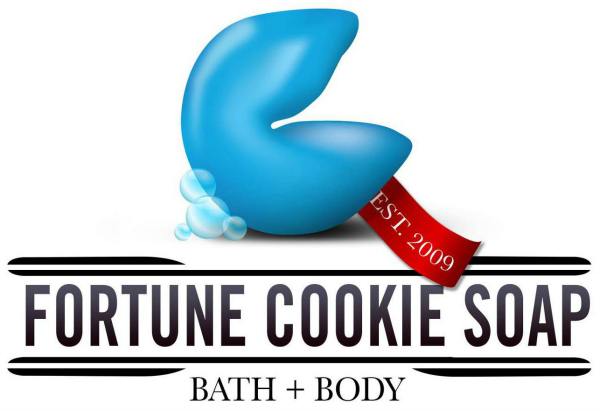 They're a bath & body company whose signature product is soap shaped like fortune cookies! 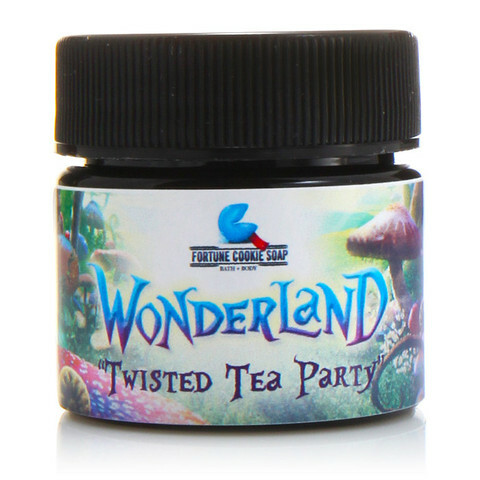 They have lots of amazing scents with really fun themes like Harry Potter, Game of Thrones, Alice in Wonderland, etc. They have tons of products like bath bombs, shampoo bars, body wash, bath salts, leave-in conditioner, perfume oil etc. Fortune Cookie Soap puts out a subscription "soap box" previewing the different themes of their major collections every quarter of the year; their most recent was the Spring "Wonderland" box. I had just heard of them from a YouTube video before the box came out and was lucky to be able to sign up for it before they sold out. I'll have to do a full review of the next box I get, let me know if you'd be interested in that! The cuticle butter I purchased comes in a 0.8 oz jar for $8.95. The ingredients are: "Shea Butter, Beeswax, Organic Coconut Oil, Lanolin, Soya Oil, Cold Pressed Avocado Oil, Mango Butter, Hydrogenated Palm Kernel Oil, Castor Oil, Olive Oil, Sweet Almond Oil, Vitamin E, and Fragrance." It seems like a very little amount in the jar, but you seriously only need to touch your finger to it to get enough for a few fingers so I know it will last a long time. It's thick and stiff at first touch (heh heh) but melts instantly into a rich oily texture when applied. It does stay greasy for longer than I would normally care for, so it might be better suited for a nighttime treatment. They also do lots of little collections in between the large ones that the "soap box" previews; their newest is an Easter theme. You can purchase their products from www.fortunecookiesoap.com. Stuff sells out fast but they do lots of restocks. Let me know if you've ever tried this brand before, I think it's just the coolest! Some of the above links are affiliates. Today I have a Girly Bits polish to show you called Seriously Sassy. 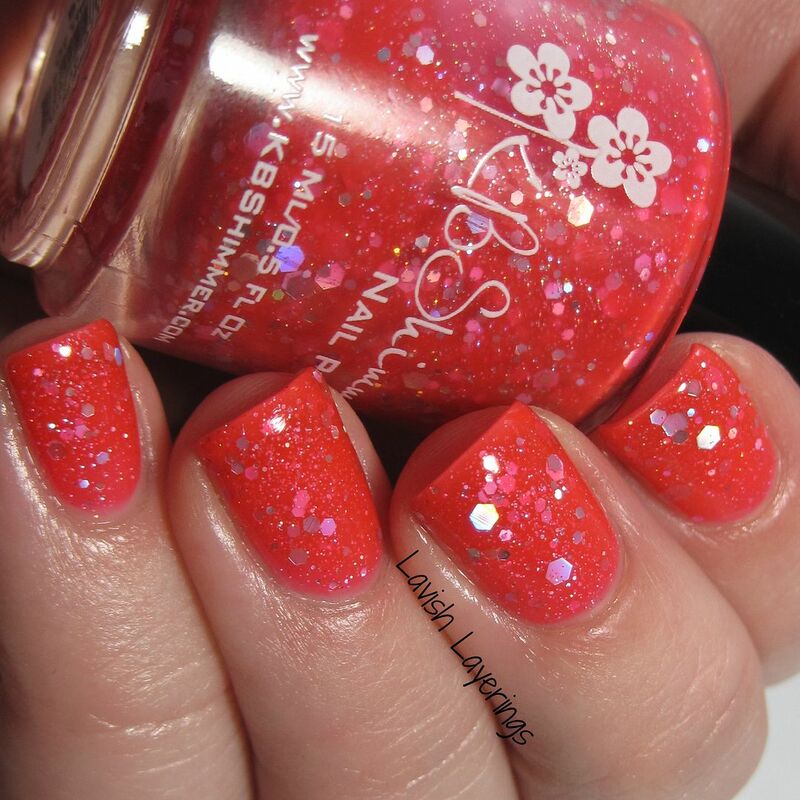 This is a collaboration shade with blogger Shelly from Sassy Shelly. She is so talented and I just adore her, check her out if you don't already. It has a royal purple jelly base with glowing blue-to-purple color shifting glitters and purple microglitter with just a hint of holo pigment in there. It had a great formula and was opaque in two coats. It does dry a little gritty so be sure to use a good thick top coat. I love the look of this, the glowy glitter makes it unique to my collection. You can purchase this from the Girly Bits website. They also stock their products at places like Llarowe, where I bought mine for $13, and at Harlow & Co. Have you tried this shade yet? This is only my second polish from Girly Bits, but I need to get more because they are great! Crystal Blue Persuasion is a "heavenly ethereal crystal blue". Sky blues look good on everyone. So you need this! Next we have Dumb Luck, a "jaw-dropping most incredible retro green". Uh, this is right on, so retro and I love it! This is Happenstance, an "over-the-top hot popping bubblegum pink". It seems to have more of a slight purple tone on the nail than it does in the bottle. It's just adorable, reminds me of cupcakes. Nothing Ventured is not a neon, it's a "sultry silvery light to medium gray". At first I would've told you that joint don't belong in this collection, but I just don't care! It's awesome and way prettier on than I expected. This gal is Pleasant Surprise, a "most luscious retro teal blue". Another retro color?! Yes please! I imagine if I lived in the 50's this would be the color of a lot of my kitchen appliances. Synchronicity is the last of the crèmes and it might just be my favorite. It's more low key than the others in terms of neon-icity but it's still quite bright. It's described as "an amazing electrified grape". Everyone needs this. All of these apply mostly the same, they are semi-matte so they dry quickly. They have a thin formula which could make for some streaky-ness. You'll need two coats, possibly three depending on your application. I used two coats for all of them except for the yellow & orange, which needed three. There is a pearly shimmer to them all (hence, the dewy moniker) that subtly twinkles when they are in their matte state, but really pops out with top coat. One layer of the holographic top coat might be a better way to go when layering, as it does get a little grey on some of them at two, but it looked good on all of them. My favorite holo + color combo is with Pleasant Surprise. Ride The Neon Rainbow is meant to be a layering top coat, but I wanted to try it on its own for kicks. It totally works! It looks brilliant and very blingy. It's thin but easy to work with. If you want complete and total opacity you might use one more coat, but it looked good to me at three. This collection is the collaborative brainchild of owner Jennifer and YouTuber JessFACE90, so please go check out her video review of these colors and give her some love if you like this collection! These will be available for purchase today on the SuperChic Lacquer - Wonder Beauty Products Etsy store at 4pm PST for $10 each. What do you think of these Spring shades?